Classical Conditioning: a basic form of learning. Classical conditioning is how we learn to associate a neutral stimulus (like a sound, or a light) with a consequence. Classical conditioning means “basic learning”. That’s it. It’s one of the simplest ways dogs (and all animals) learn. You may also hear it referred to as Pavlovian conditioning or associative learning. Once you understand this principle you will be able to truly see what is going on behind some "mysterious" pet behaviors. For example, have you ever heard (or maybe even experienced) that dogs have a “sixth” sense? _ “My dog gets so excited when I pick up the leash, he knows we are going for a walk!. _ "My dog knows when she did something wrong! she hides under the table with her tail between her legs before I even say anything!" 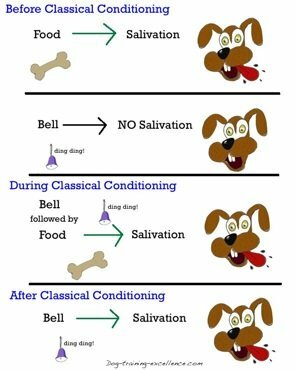 These classical conditioning examples (and million others like that) are not because dogs have a "sixth" sense. Dogs can predict what happens because they learn through classical conditioning. Hos does classical conditioning work? Going out for a walk (US): exercise, social interactions with other dogs and people, interesting smells are all things that produce hormones that make dogs "happy" (UR). Your son arriving at the door and feeding the dog (US): social interactions with a family member and eating are all events that also trigger happy feelings as well as the feeling of hunger/eating (UR). You scold or punish your dog (US): elicits the feeling of fear and the actions of tail in-between the legs, ears back and maybe whining (UR). the sound of the leash (CS) predicts going out for a walk and makes the dog feel excited (CR). the sound of the car engine (CS) predicts your son is arriving and will feed the dog which makes him feel exctited (CR). your particular set of "upset" body language signals (CS) predict you are about to get really mad and punish your dog, he feels fear (CR). The dog has learned to associate two events. The sound of the leash clicking will make the dog just as happy (for an instant) as being on the walk itself! The sound of the car engine will make the dog just as happy (for an instant) as greeting your son and eating! The vision of your particular "upset" body signals will make the dog feel just as afraid as if you were actually punishing him! 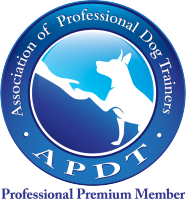 What does this mean to dog trainers? 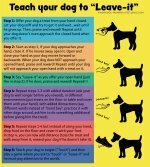 You will be able to train your dog to "feel good" about a particular signal. For example a Marker Word or a distinct sound like a clicker. Then you can use the signal as the reward itself! If you would like to learn more about dog training and animal psychology, these are excellent books recommended by the best dog trainers (and read by them several times too!). You must be careful too, or you can accidentally condition your dog to be fearful of certain things. The classic example is leash-aggression. When dogs are young and you first take them out for walks, it is natural to feel a little protective of your new furry friend. When other canines approach you unconsciously pull on the leash and tense up. 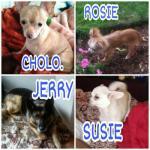 Your pooch feels your reaction and eventually will see other dogs and tense up just like you do. Then, a handful of intense encounters might set your dog off, and now you have a dog that reacts only when he is on the leash. Classical conditioning is also known as "Pavlovian Conditioning". Ivan Pavlov, a Russian physiologist, discovered this learning principle by accident. He was a scientist interested in gastric function. He used dogs to study salivation. Second (event): he gave the dog food and measured salivation. He repeated the experiment many times with the same dogs. Fourth (conditioning): This is what he discovered. Dogs only salivate after food is delivered to them, not at the sound of a bell. But after many repetitions of his experiment, dogs started salivating when they heard the bell (and before the food was presented to them!). The dogs learned to associate the bell sound with food and salivated in anticipation. Watch this 1 minute clip from an episode of "The office"
An excellent example of classical conditioning and fun! Don't you want to do it on a friend? Well, you will be doing it with your dog! First (signal): the computer reboots and makes the characteristic sound. Fourth (conditioning): After many repetitions, Dwight expects an Altoid after he hears the sound and involuntarily extends his arm! I have been classically conditioned too! We, humans, can also be classically conditioned. Here is what happened to me. My husband and I spent the first 2 years of our relationship apart (because I was finishing school in Argentina). Every night we spent time together on ICQ (an old messenger program). Years after I moved to the US I happened to turn the ICQ program (even though my husband was right next to me). Somebody else came online. I heard the sound "Knock-knock"! The particular signal initially doesn't have any specific meaning. But our brain learns to associate it with an event that immediately follows. This is useful information, we can predict important events! Eventually those two events become like one to our brain ... and to your dog's brain too! How animals learn to associate two things. The first predicts the second. The dog has no control over the signal, the dog can't make the signal happen. That is the next subject Operant Conditioning! Click to learn more!